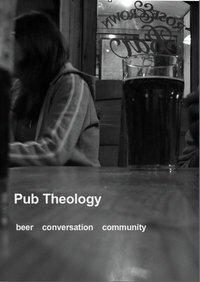 The title pretty much sums yup the variety of topics that we covered at our last pub theo session. At times the discussion got heated and at times I felt a need to play a devils advocate kind of role to fuel the flames …. the discussion was live, fun, noisy and challenging. I was very conscious of people around eavesdropping on conversations and wonder if one day one of those people will venture into the group. I still reckon people want to engage with questions. WE all naturally question, I believe it is a human attribute, and yet there are few places today where people can go to debate anything. pub theo is a place to debate anything and everything. It’s right that at times it should become lively as we disagree with each other but still get on together. If you missed this one then you will have a little wait before the next pub theo, which will break for Christmas meaning the next time together will be in The Golden Lion on Monday 30th January. As there is a 2 month gap we agreed to try and read Rob Bell’s Love Wins and chat about some of the stuff in that …. so a topic like heaven and hell, who is in and out, is hell a literal place … and stuff like that! Maybe see you on 30th Jan!